January 17 Update: Market Street between 13th Street and Cameron Street is open again. Thank you for everyone’s patience while we invested over $1 million to repair two 100-year+ sewers and install additional storm drains to improve drainage. There is temporary asphalt in place now. Final street restoration will take place when temperatures rise and asphalt plants reopen. Two 36-inch sewer mains built in 1885 and 1912 run below Market Street conveying a combination of stormwater and wastewater to Capital Region Water’s Advanced Wastewater Treatment Facility. 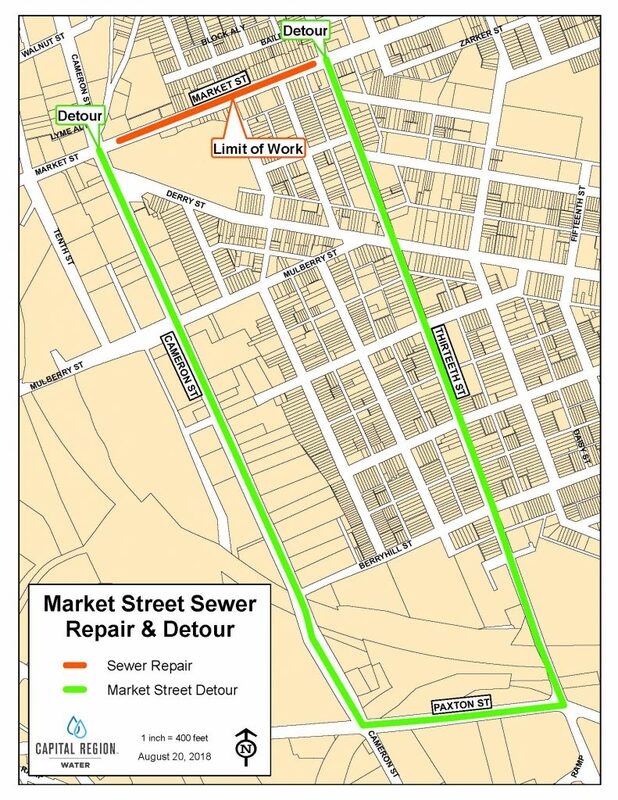 This project will rehabilitate 2,120 feet of 36-inch sewer mains with cured-in-place pipe lining, pipe replacement, and new manholes along Market Street between 13th Street and Cameron Street. Above ground pipes will be installed in the project area to bypass flows while cured-in-place pipe and replacement work occurs. Cured-in-place pipe will be installed inside the existing sewer pipes to create a new, structurally sound pipe. Excavation and pipe replacement will occur in areas where cured-in-place pipe cannot be installed. To protect public safety, Market Street will be closed between 13th Street and Cameron Street during this work. Capital Region Water will provide advanced notice of this temporary detour on Capital Region Water’s website, Nextdoor.com and Twitter. •The sidewalk will be open to pedestrians in the project area. •Traffic will be detoured to Paxton Street. Please call Capital Region Water at 888-510-0606 or email info@capitalregionwater.com if you have any questions. Thank you for your patience while we invest in our community.